I started my build with a goal of being able to cruise my big arse (200+ with gear) at 55 mph regardless of the conditions. In order to be able to get on the highway when it was necessary to expedite travel time. ( 90% of my riding is backroads ar or under 45mph ). Well after more money than I care to recall I’ve one upped myself. I can now cruise at 60+mph at or under 7500 rpms all day regardless of the conditions. I wanted to be able to pull this off in order to not have to rev the ever living crap out of the bike for longevity’s sake. I put on a 32T rear tonight to go with the 16T up front and voila ! Along with my engine mods, fueling etc. I’ve surpassed what I thought was attainable with the Grom. 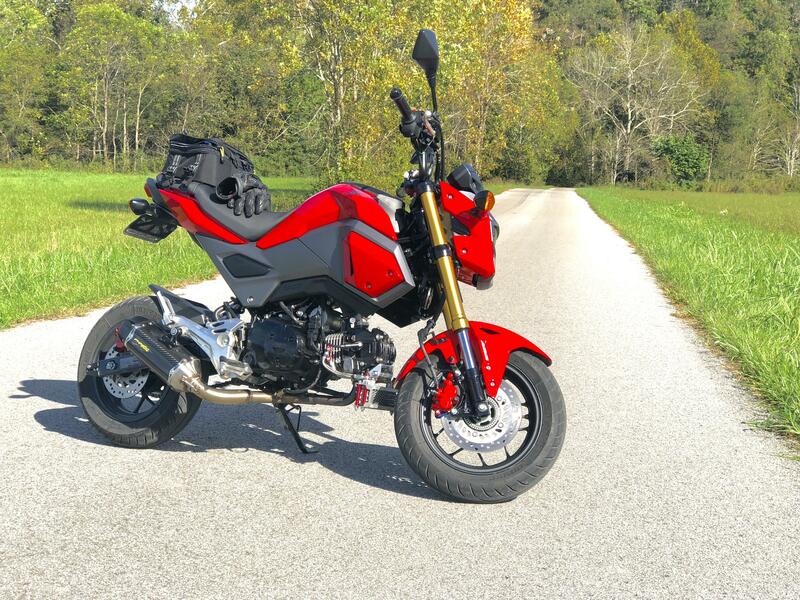 So, as long as it holds together and doesn’t wind up a pile of parts on the side of the road, I just may be done throwing money at the Grom ( he says with a smile ). Thanks to this forum and the guys here that have been so helpful when things weren’t going well with the build. You know who you are ! Now it’s my turn to pay it forward. Ride safe everyone the season is upon us ! Last edited by kc4sox; 03-29-2019 at 06:00 PM. grommyk, mikochu, MSX UD ITA and 4 others like this. Quitting on one's goals is for losers. MAGA! lol... one is never truly done. Congrats KC glad you were able to accomplish what you were wanting out of your Grom,,, Gotta be the best feeling. Congrats! I wish I could reach 90mph ~ 100mph on my Grom, now tops 60mph ~ 65mph. I do 100% ridding on the streets but if I could go over 60mph I may try going in the FWY. Even though, at 3:00 pm the top speed on the 10fwy is like 25mph. 4V head on 125cc ? can it be done ? has it been done?